Whatever the reason, the Juke was saddled with polarizing styling, a situation that led to it being replaced by the more sanely styled but even more stupidly named “Kicks.” its looks were also the likely cause of yesterday’s hot edition gaining a 70 percent Crack Pipe loss at its $12,000 price. See people, appearance matters. Also, don’t give your kids weird names. Speaking of looks, look at what we have here. What’s that? Stop yawning. Okay, I will admit that the only majorly engaging element of this 1987 Lancia Thema 8.32’s aesthetics is that you always feel like you’ve seen it before, but can’t quite place where. The fact of the matter is that, for those of us us here in the U.S., this Thema is a foreign object. 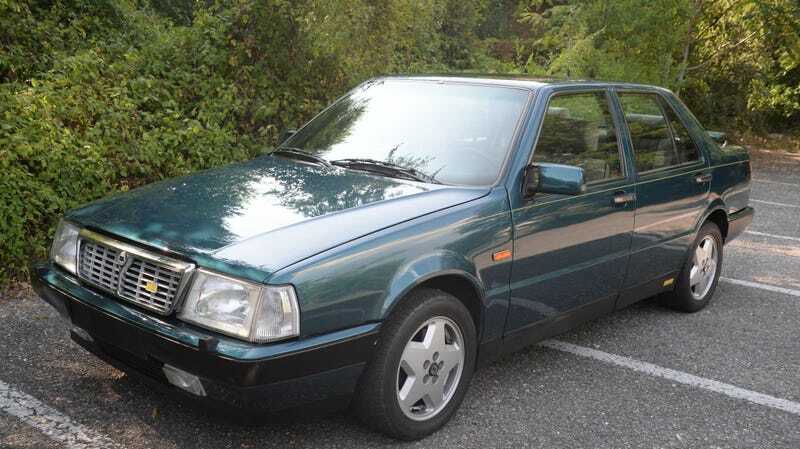 That being said, it shares its platform with another car we didn’t get, the Fiat Chroma as well as two we did, the Alfa Romeo 164 and the Saab 9000. The uncanny valley nature of the Thema probably lies in the saloon sharing not just the underpants with the latter car but also its doors and window shapes. As a result, the Thema comes across as stately but woefully unexciting. Ah, but wait. In the case of this one, that staid appearance is more than made up for by what lies under the hood and the cool spoiler that pops up out of the boot lid announcing that engine’s intentions. In the nose lies the raison d’etre for the 8.32 appended to the Thema’s name. That, somewhat cryptic combination stands for 8 cylinders and 32 valves and those all come to us by way of Ferrari. Yes, the Thema is powered by a retuned edition of the lovely little V8 that first saw duty in Ferrari’s 308 GTB/S and Mondial Quattrovalvole. It’s accompanied by a similar five-speed manual transaxle too. Now, the engine is different from its Ferrari cousin in a number of ways, all adopted to make it more suitable for sedan work. Those changes included a switch from a flat plane crank to cross plane and a change in the firing order. It still proved to be good for 212 horsepower and 210 lb-ft of torque in the Thema. Those were impressive numbers at the time and allow the 3,086 pound sedan to keep up with modern day traffic without any issue. Also, there’s the sound. Oh lawdy, the sound. This car is offered by a dealer in the San Francisco Bay Area and is claimed to have all the necessary import paperwork in place. It doesn’t actually seem to be here in the States, and in fact importing it into California where the dealer is located would be challenging since that State has it’s own set of emissions regulations for cars newer than 1975. Still, this Thema hasn’t just been twiddling its Ferrari imbued thumbs over in Europe waiting for a buyer. The dealer notes in the ad that the car has been gone over and refreshed in areas that needed some upkeep. That included a respray in the factory green, and finished with a double shot of clear coat. Beneath that the suspension, brakes and engine consumables have all seen attention, as has the exhaust and A/C. The car is presently said to look and run like a dream. The interior seems up to the task as well. In there you’ll find lovely beige Alcantara covering barcalounger-like seats and yellow-marked gauges set into a burl wood dash. Of course there are power seats, windows and whatnot, and those are all claimed to be in fully working order. The car shows an unremarkable 158,287 kilometers on the clock. Lancia built the Thema 8.32 in very small numbers over the course of seven model years. In all, fewer than 4,000 were built, and as you might expect even fewer remain today. In Europe, a nice one can go for around 20,000€. That works out to about $22,000 American and that puts this car’s $32,975 price at a premium. That being said, this does appear to be a premium ride and a bit of history that you definitely won’t see everyday—well, outside of its Saab-sharing doors. There’s also the issue of the importation hassle. If you really have a hankering for an 8.32 then wouldn’t you want to make sure that your purchase is too legit to quit? Wouldn’t you further see no issue in paying a little more to have all the paperwork handled for you? With all that in mind, what’s your take on this Thema and that $32,975 asking? Does that feel like a fair deal to bring the car into both the States and your life? Or, does that feel like high-seas robbery?